As this year's winter freeze hits, many thousands of unlucky homeowners will suffer the costly effects of burst water pipes. Burst pipes can happen year-round but they're a particular problem in winter. It happens when the water in a pipes freezes and expands, causing the pipe to crack, split, and—when the ice melts—to flood the space beneath them. Water damage accumulates fast, so acting quickly is key. If you're an Alarm.com user, you'll have several advantages. The best way to prevent a burst pipe is to act before it freezes—but until now that's been nearly impossible. An Alarm.com temperature sensor is the answer in many cases. By placing one in your home's basement of crawlspace near your water supply, you can get a remote reading of the area's temperature anytime. You can also set up a smartphone alert to warn you if the temperature drops to an unusually low point, enabling you to take emergency anti-freeze measures such as deploying a portable heater or leaving a faucet trickling overnight. 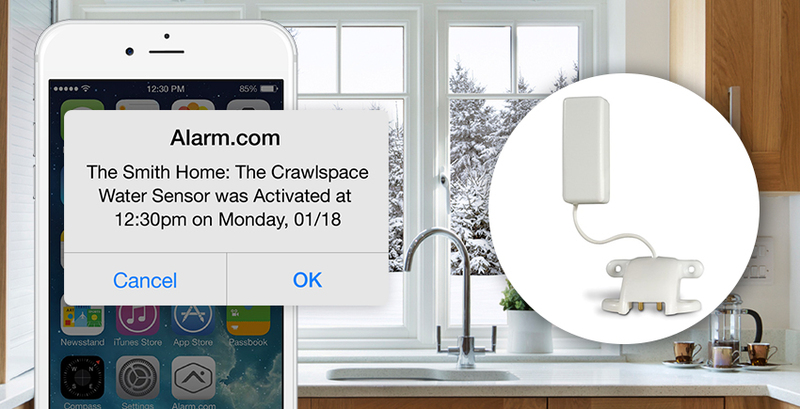 A water sensor placed on the floor in strategic areas like your basement or crawlspace (where burst pipes most often occur) will instantly send you an alert when water is detected. You can act quickly and minimize damage. If you're not there to shut off your water supply, an Alarm.com-powered smart lock on your front door allows you to let a trusted neighbor or local plumber into the house. The best option when a pipe bursts is to have your home respond automatically when it detects a burst pipe. Alarm.com's water solution includes a smart water valve that shuts off your water supply when triggered by a water sensor. It's broad protection from a costly problem that homeowners face all too often this time of year.